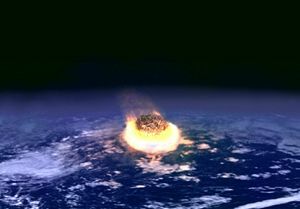 Artist's impression of a major impact event. The collision between Earth and an asteroid a few kilometers in diameter may release as much energy as several million nuclear weapons detonating one after another. Many scientists think that the Chicxulub Crater in the Yucatán Peninsula of Mexico was created by an asteroid impact, wiping out the dinosaurs and other species. Catastrophism is the idea that Earth's features have remained fairly static until dramatic changes were wrought by sudden, short-lived, violent events (catastrophes) that were occasionally worldwide in scope. By contrast, during most of the nineteenth and twentieth centuries, the dominant paradigm of geology has been uniformitarianism, also known as gradualism, according to which Earth's features have been gradually but continually changing, eroding and reforming at a roughly constant rate. Recently, however, the scientific consensus has been changing toward a more inclusive and integrated view of geologic events, reflecting acceptance of some catastrophic events along with gradual changes. Before uniformitarianism, the dominant belief in many cultures of the creation and development of the world was essentially catastrophism. While the biblical account of the Great Flood is a prime example of these beliefs, it is also "stated in scientific method with surprising frequency among the Greeks," an example being Plutarch's account in his chapter on Solon. Earth's history was viewed as the result of an accumulation of catastrophic events over a relatively short time period. It was basically the only way to rationalize the observations of early geologists (before the eighteenth and nineteenth centuries) with what was thought to be a short history of Earth. The leading scientific proponent of catastrophism in the early nineteenth century was the French anatomist and paleontologist Georges Cuvier. His motivation was to explain the patterns of extinction and faunal succession that he and others were observing in the fossil record. While he did speculate that the catastrophe responsible for the most recent extinctions in Eurasia might have been the result of the inundation of low-lying areas by the sea, he never made any reference to the Noachian flood. Nor did he ever make any reference to divine creation as the mechanism by which re-population occurred following the extinction event. In fact Cuvier, influenced by the ideas of the Enlightenment and the intellectual climate of the French Revolution, avoided religious or metaphysical speculation in his scientific writings. Cuvier also believed that the stratigraphic record indicated that there had been several of these catastrophic events, which he viewed as recurring natural events, amid long intervals of stability during the history of life on earth. This led him to believe the Earth was several million years old. By contrast in England, where natural theology was very influential during the early nineteenth century, a group of geologists that included William Buckland and Robert Jameson would interpret Cuvier's work in a very different way. Jameson translated the introduction Cuvier wrote for a collection of his papers on fossil quadrapeds that discussed his ideas on castastrophic extinction into English and published it under the title Theory of the Earth. He added extensive editorial notes to the translation that explicitly linked the latest of Cuvier's revolutions with the Biblical flood, and the resulting essay was extremely influential in the English speaking world. Buckland spent much of his early career trying to demonstrate the reality of the biblical flood with geological evidence. He frequently cited Cuvier's work, even though Cuvier had proposed an inundation of limited geographic proportions and extended duration, and Buckland, to be consistent with the biblical account, was advocating a universal flood of short duration. Eventually, Buckland would abandon flood geology in favor of the glaciation theory advocated by Louis Agassiz who had briefly been one of Cuvier's students. As a result of the influence of Jameson, Buckland, and other advocates of natural theology, the nineteenth century debate over catastrophism took on religious overtones in Britain that were not nearly as prominent elsewhere. Either they are the effects of upheavals of the crust of the earth, such as might occur during a violent earthquake, or they are the effect of water, which, cutting itself a new route, has denuded the valleys, the strata being of different kinds, some soft, some hard… It would require a long period of time for all such changes to be accomplished, during which the mountains themselves might be somewhat diminished in size. Later in the eleventh century, the Chinese naturalist, Shen Kuo (1031-1095), also recognized the concept of deep time. After The Book of Healing was translated into Latin in the twelfth century, a few other scientists also reasoned in uniformitarian terms, but the theory was not proven until the late eighteenth century. The uniformitarian explanations for the formation of sedimentary rock and an understanding of the immense stretch of geological time or "Deep time," were proven by the eighteenth century "father of geology" James Hutton and the nineteenth century geologist Charles Lyell. At the beginning of the nineteenth century, the great French geologist and naturalist Baron Georges Cuvier proposed what came to be known as the Catastrophe theory or Catastrophism. According to the theory, the abrupt faunal changes geologists saw in rock strata were the result of periodic devastations that wiped out all or most extant species, each successive period being repopulated with new kinds of animals and plants, by God's hand. [Charles] Lyell rejected so non-scientific a hypothesis (as did James Hutton before him), and replaced it with the notion that geological processes proceeded gradually—all geological processes (Lewin 1993). From around 1850 to 1980, most geologists endorsed uniformitarianism, with the concept that "the present is the key to the past," and gradualism, with the belief that geologic change occurs slowly over long periods of time. They rejected the idea that cataclysmic events such as earthquakes, volcanic eruptions, or floods of vastly greater power than those observed at the present time played any significant role in the formation of the Earth's surface. Instead they believed that the Earth had been shaped by the long-term action of forces such as volcanism, earthquakes, erosion, and sedimentation, that could still be observed in action today. In part, the geologists' rejection was fostered by their impression that the catastrophists of the nineteenth century believed that God was directly involved in determining the history of Earth. Catastrophism of the nineteenth and early twentieth centuries was closely tied to religion and catastrophic origins were considered miraculous rather than natural events. In the 1950s, Immanuel Velikovsky propounded catastrophism in several popular books. He speculated that the planet Venus is a former "comet" that was ejected from Jupiter and subsequently, 3,500 years ago, made two catastrophic close passes by Earth, 52 years apart, and later interacted with Mars, which then had a series of near collisions with Earth which ended in 687 B.C.E., before settling into its current orbit. Velikovsky used this to explain the biblical plagues of Egypt, the biblical reference to the "Sun standing still" for a day (explained by changes in Earth's rotation), and the sinking of Atlantis. In general, scientists rejected Velikovsky's theories, often quite passionately. Attempts were made to prevent the publication of his books by pressuring his first publisher, Macmillan, which only increased the books popularity. Not all scientists shared this viewpoint, and his supporters point out that Albert Einstein remained a close friend of Velikovsky's until his death. However, Einstein made it clear in their correspondence that although he had come to accept the fact of global catastrophism, he did not accept his friend's ideas regarding Venus as one of its causes. Over the past 25 years, however, a scientifically based catastrophism has gained wide acceptance with regard to certain events in the distant past. One impetus for this change came from the publication of a historic paper by Walter and Luis Alvarez in 1980. This paper suggested that a 10 kilometers (6.2 mi) asteroid struck Earth 65 million years ago at the end of the Cretaceous period. The impact wiped out about 70 percent of all species, including the dinosaurs, leaving behind the so-called K-T boundary. In 1990, a 180 kilometers (110 mi) candidate crater marking the impact was identified at Chicxulub in the Yucatán Peninsula of Mexico. Since then, the debate about the extinction of the dinosaurs and other mass extinction events has centered on whether the extinction mechanism was the asteroid impact, widespread volcanism (which occurred at about the same time), or some other mechanism or combination. Most of the mechanisms suggested are catastrophic in nature. The observation of the Shoemaker-Levy 9 cometary collision with Jupiter illustrated that catastrophic events occur as natural events. Modern theories also suggest that Earth's anomalously large Moon was formed catastrophically. In a paper published in Icarus in 1975, William K. Hartmann and Donald R. Davis proposed that a stochastic catastrophic near-miss by a large planetesimal early in Earth's formation approximately 4.5 billion years ago blew out rocky debris, remelted Earth and formed the Moon. This theory would explain the Moon's lower density and lack of an iron core. One of the key differences between catastrophism and uniformitarianism is that uniformitarianism requires the assumption of vast time scales, whereas catastrophism can function with or without assumptions of long time scales. Today most geologists combine catastrophist and uniformitarianist standpoints, taking the view that Earth's history is a slow, gradual story punctuated by occasional natural catastrophic events that have affected Earth and its inhabitants. ↑ 8.0 8.1 Munim M. Al-Rawi and Salim Al-Hassani, The Contribution of Ibn Sina (Avicenna) to the development of Earth sciences, FSTC. Retrieved October 5, 2008. ↑ 9.0 9.1 Stephen Toulmin and June Goodfield, The Ancestry of Science: The Discovery of Time (Chicago, IL: University of Chicago Press, 1965), 64. ↑ Nathan Silvin Science in Ancient China: Researches and Reflections (Brookfield, VT: Ashgate Publishing 1995, ISBN 9780860784920). ↑ Lee Krystek, Venus in the Corner Pocket: The Controversial Theories of Immanuel Velikovsky, The Museum of Unnatural Mystery. Retrieved October 5, 2008. ↑ 13.0 13.1 Steven Dutch, Velikovsky, University of Wisconsin—Green Bay. Retrieved October 5, 2008. ↑ Planet X and the Pole Shift, Didn't Einstein support Velikovsky's theories? Retrieved October 5, 2008. ↑ The Velikovsky Correspondence, The Einstein-Velikovsky Correspondence. Retrieved October 5, 2008. King, Clarence. 1877. Catastrophism and Evolution. The American Naturalist. 11 (8): 449-470. Lewin, R. 1993. Complexity. New York, NY: Macmillan Pub. Co. ISBN 9780025704855. Palmer, T. 1994. Catastrophism, Neocatastrophism and Evolution. London, UK: Society for Interdisciplinary Studies in association with Nottingham Trent University. ISBN 0951430718. Rudwick, Martin J.S. 1972. The Meaning of Fossils. Chicago, IL: The University of Chicago Press: ISBN 0226731030. McGowan, Christopher. 2001. The Dragon Hunters. Cambridge, MA: Persus Publishing. ISBN 0738202827. Venus in the Corner Pocket : The Controversial Theories of Immanuel Velikovsky. Catastrophism! Man, Myth and Mayhem in Ancient History and the Sciences. Old Earth Creation Science: Catastrophism, or Uniformitarianism? This page was last modified on 18 January 2017, at 15:36.